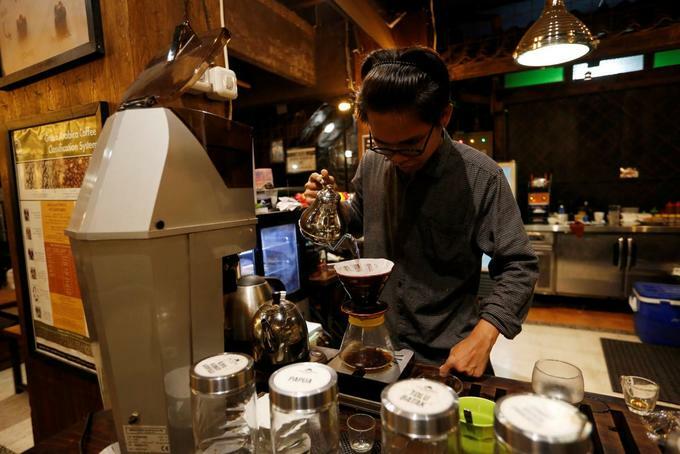 Coffee consumption in Indonesia has nearly doubled in the past 10 years as many youths developed the habit. For decades, Indonesia has supplied coffee roasters worldwide with prized beans that give a distinctive taste to brews favored by connoisseurs. Most locals, however, preferred tea. But now, as younger generations switch to coffee and hundreds of independent coffee shops and roasters pop up across the archipelago, Indonesia’s consumption of beans is rising. That’s left less coffee for export and forced up prices for foreign buyers. A small harvest in Sumatra has eaten further into tightening supplies of that region’s unique arabica beans, which are sought for the heavy, earthy notes they give to roasted blends. Sumatran beans are a key component in Starbucks Corp’s Christmas Blend, which has been sold for more than 30 years. Sumatra’s lower production caused some exporters to delay and even default on deliveries, sources at importing companies said, forcing some U.S. importers to pay more to secure supplies. Inventories in the United States have dwindled, with many importers saying they have enough to meet contracts with roasters but nothing left for the spot market. Major roasters Starbucks and Keurig Green Mountain Inc are the biggest buyers of Sumatran arabicas, importers say, and smaller companies appeared to be facing the biggest challenges sourcing those beans. A Starbucks spokeswoman said the company has not been impacted by the region’s tight supplies this year. Keurig did not respond to requests for comment. Coffee consumption in Indonesia has nearly doubled in the past 10 years, as many young Indonesians were influenced by coffee habits in countries such as Australia and the United States where a lot of them went to study. “We’re seeing very strong coffee expansion in many markets but Indonesia is very much a market where demand is growing heavily,” said Michael Schaefer, global lead of Food and Beverage at Euromonitor International. While major producing countries such as Brazil, Vietnam, Colombia and Indonesia have historically exported their best coffee, rising interest in premium beans from local coffee shops is changing this, Schaefer said. Many new roasters are offering farmers significantly higher prices for their arabica beans, said Pranoto Soenarto, vice president of the Association of Indonesia Coffee Exporters and Industries. Irvan Helmi, co-founder of local roaster and cafe Anomali in Jakarta, said local buyers’ close proximity to farmers enabled them to pay higher prices while selling directly to consumers at better profit margins. Wildan Mustofa, an arabica coffee farmer with a mill in Pangalengan, West Java, said his domestic sales are rising fast. “The local purchases grow by almost 100 percent every year,” said Mustofa, while helping workers spread out coffee cherries to be dried under the sun. Compounding the shortage of beans for overseas buyers is a fall in output. Indonesia’s annual coffee bean output has fallen by around 8 percent over the past five years, Indonesian Agriculture Ministry data shows. Farmers say unpredictable weather, poor crop maintenance and switching to other crops is responsible for lower yields. Exports from the world’s fourth largest-coffee growing nation have dropped by around 20 percent over the past five years, according to data from the U.S. Department of Agriculture (USDA). The country’s tight supplies are already reflected in first-quarter 2018 shipping data, with coffee exports down 26 percent from the same period in 2017, Indonesia’s Statistics Agency data show. In Sumatra, a large and mountainous island west of the capital Jakarta, limited availability of arabica coffee sent prices to a record high in April. Arabica is a higher quality bean that is typically roasted and brewed. Its cousin robusta, known for its more bitter taste, is processed into instant coffee or used as a lower cost component in roasted blends. Robusta makes up nearly 90 percent of Indonesia’s coffee harvest. The arabica grown in Sumatra is unique, in part due to the unusual bean drying process employed there. While farmers in other countries have tried to replicate it, importers said results are unreliable and only on a small scale. “Competition to buy coffee from producers has been pretty fierce,” said Robert Babington Smith, a senior trader for California-based importer InterContinental Coffee Trading Inc.
Prices of unprocessed or partially dried Sumatran arabicas purchased at farms rose to a record $5.90/kg in April, while arabica beans already in U.S. warehouses fetched premiums of$2.20/lb or more over the global benchmark price, nearly double last year’s price, Babington Smith said. Babington Smith said one his suppliers defaulted on a planned delivery due to that exporter’s lack of funds to purchase the increasingly expensive coffee. Another importer said five of his containers were defaulted on after his company refused to pay more than the contracted price. “We get calls every day from roasters asking if we have any Sumatrans, spot or on the water,” the importer said.